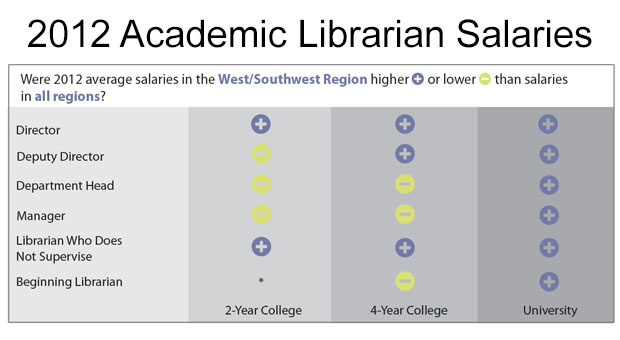 Our newest Fast Facts report analyzes results from the 2012 American Library Association-Allied Professional Association (ALA-APA) Salary Survey to better understand how academic librarians’ salaries in the West and Southwest (the region including Colorado) compare to other regions. The survey breaks down salaries by job category and institution type, and it covers positions that require an ALA-accredited MLIS/MLS and offer salaries of more than $22,000. What did we find? University librarians in the West and Southwest earned higher average salaries in every job position in 2012. Directors and librarians who don’t supervise others earned more in average salary in the West and Southwest across all institution types. But two-year college librarians had challenges: middle management (managers and department heads) and deputy directors in the West and Southwest earned less than the average salaries in all regions. Read more about the 2012 salary figures in our infographic and Fast Facts report, 2012 Academic Librarian Salaries: The West & Southwest Region Remains Competitive. And compare these figures with 2010 ALA-APA Salary Survey results in Fast Facts No. 297, 2010 Academic Librarian Salaries: West and Southwest Region Offers Competitive Pay.